Bermuda's South Shore beaches are renown as the best beaches on the island. Not only are they attractive as beaches but they offer great natural beauty. Moreover, the best of the best are not far from the Royal Naval Dockyard, where virtually all the cruise ships calling in Bermuda dock these days. Four of Bermuda's South Shore beaches are connected. Starting at the world famous Horseshoe Bay Beach in Southampton Parish you can walk all the way to Warwick Long Bay Beach in Warwick Parish through South Shore Park. It is not that great a distance - - about a mile and change - - but it does provide some moderate exercise and along the way, you can swim in secluded beaches, see exotic rock formations, and mix with nature. 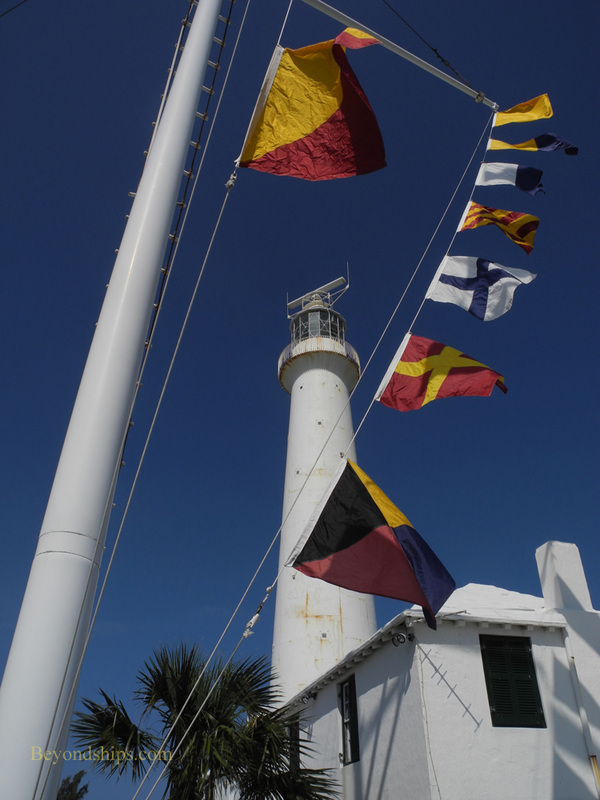 At the end of the walk, you can head directly back to the Dockyards or go on into Hamilton, Bermuda's capital. 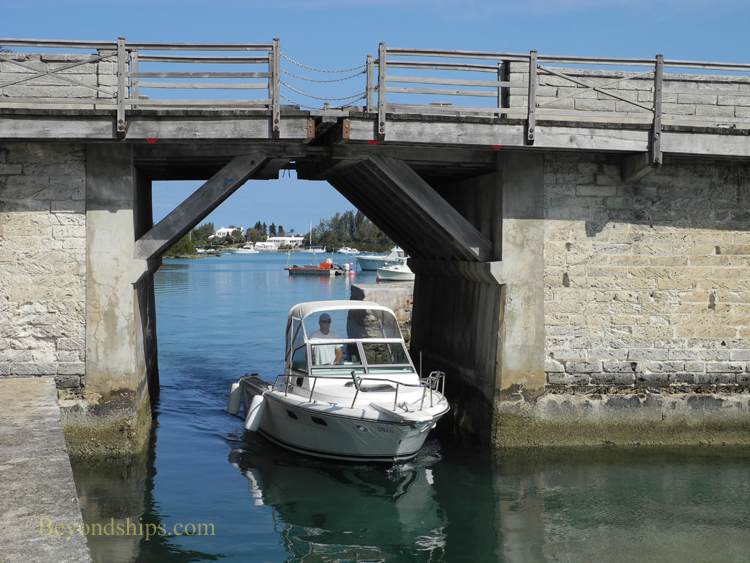 It is a journey that gives you a glimpse of much - - but by no means all - - of what Bermuda is famous for. The most cost effective way to get from the Dockyards to Horseshoe Bay is by the public bus. The per ride fare is not much and if you buy a day pass or a multi-day pass, you can travel on the buses and ferries all over the island at a bargain rate. Often when the cruise ships are in port, there is a bus that goes non-stop from the Dockyards to Horseshoe Bay. 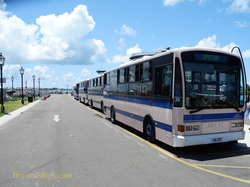 These wait for passengers in a small parking area near the end of Heritage Wharf near the Dockyard's Moongate. If these “Special” buses are not running you can get to Horseshoe Bay on the Number 7 bus, which waits near the entrance to the National Museum (formerly the Maritime Museum). This bus will get you there but it does take longer. There is also a mini-bus shuttle that runs to and from Horseshoe Bay. The cost is somewhat more per person but the mini-bus takes you down the hill directly to the entrance to the beach. The mini-buses leave the Dockyard from the parking area near Heritage Wharf. 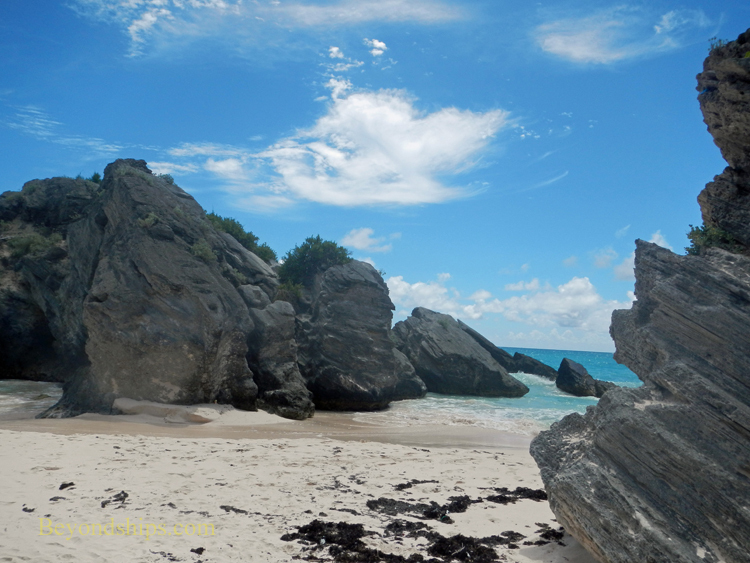 On the way to Horseshoe Bay, you pass a number of Bermuda's better known attractions. These include the Somerset Bridge, reputably the world's smallest draw bridge. Gibbs Hill Lighthouse appears on a rise on the left side of the bus and shortly after that you pass the Fairmont Southampton Hotel (formerly the Southampton Princess) with its exotic-looking, rolling golf course. On the right hand side, you pass sections of the coastline with luxury homes and pleasure boats moored offshore. Then, towards the end of the journey, you can look down at Church's Bay from the top of the cliffs. It is a small beach at the base of bare rock formations and quite picturesque.